Under its Live Barcelona Project, the government of Catalonia provides over 240 charging stations for electric vehicles all over Barcelona city in order to promote electric mobility. The Spanish city is fast becoming the hub of electric mobility innovation. Barcelona, the capital of Catalonia (Northeast Spain) and the second largest city of Spain, is proving its commitment to environmental concerns in a dedicated manner. Electric Mobility is a much focussed area of this 16th most visited city in the world and the fourth most visited city in Europe. Its LIVE Barcelona Project with LIVE standing for Logistics for the Implementation of the Electric Vehicle gains much significance in this respect. LIVE Barcelona, as it is generally known, is an open public-private platform that promotes the use of electric vehicles in the city as an opportunity to position Barcelona as a centre of innovation in electric mobility on an international platform. Under the project, the administration has provided over 240 charging points for electric vehicles throughout the city. Pruneda opines that research and development of electric mobility solutions have gained much importance all over the world. Hence, cities are emerging as potential test beds to apply these new technologies. Barcelona’s Metropolitan Area has come to play a major role in Europe’s automotive industry with 30% of the industry established in it. Hence, providing support for the development of electric mobility gains huge significance given the global competitiveness of the area’s automotive sector. “LIVE is the platform to promote the electric vehicles in the city with an aim to make Barcelona a centre of innovation in electric mobility on a world-wide scale,” says Pruneda. Under the project, the drivers/owners of electric vehicles can recharge their vehicles at any of the 242 charging points all over the city. Even private vehicles can be recharged at the Municipality’s recharging stations. “The infrastructure is developed for public access,” says Pruneda. “You need an I-Card to identify yourself as a user of an all-electric or plug-in hybrid vehicle, that’s all. Several initiatives have been taken under the umbrella of the wide network of LIVE, to develop and build a public charging network for electric vehicles in most parts of Europe. Barcelona has positioned itself as a pioneer city in Spain to introduce and operate this infrastructure, based on an open implementation model which aims to install different technologies from different suppliers or operators. The emergence of entrepreneurs and transformation opportunities being grabbed by more and more established companies is an encouraging sign for us. The intention is to keep the distribution of charging work as uniform as possible throughout so that fair service is assured to the end-user”. Points of public access for electric cars and motorbikes are also provided at underground / off-street public and private parking spaces linked to important commercial centres and other business establishments. Of course, breakdowns are witnessed at times but the Municipality has an agreement with the infrastructure providing companies to repair the stations between two to 24 hours. “The breakdown rate is low,” avers Pruneda. Apart from the 242 public charging stations, the city has over 100 private charging points too. 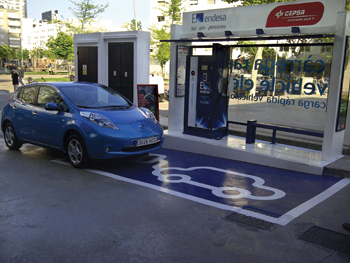 Barcelona is the first city in Spain and the fourth in Europe to offer a Quick Recharge – a very new technology. The plan, while devising the infrastructure – both public and private, is to achieve a range of over 350 charging points by the end of 2012 and later reach 800 points. 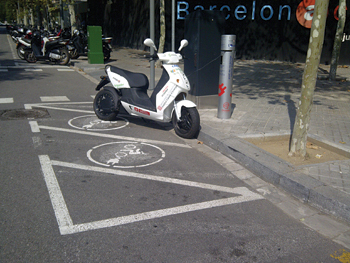 Different hotels in Barcelona participate in a new initiative called Mobec Hotels — a mobility sharing system for tourists and city visitors with electric motorbikes. 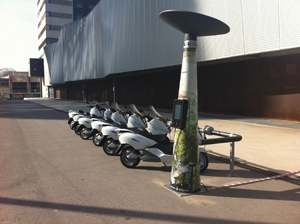 The project, led by the Barcelona Hotel Association and Barcelona City Council, consists of installing a network of Mobecpoint charging stations for six vehicles in front of the participating hotels. Six rental two-wheel electric vehicles are made available for the hotel’s guests with an aim to offer a cheap, sustainable and efficient transportation system to the tourists. The hotels, on the other hand, implement environmental and corporate social responsibility by participating in the programme. A citizen’s office too has been set up under the project to provide information to citizens and companies regarding the electric mobility services and to support the municipality of Barcelona offers. Websites and social networking sites are used to promote the programme and give information on the public network of charging points. What is important is that Barcelona city (not the Metropolitan area) has a total of only about 981 vehicles including 597 cars, 205 motorbikes, 88 motorcycles, 33 vans and 27 trucks according to 2010 figures. The Metropolitan authority is taking such strong measures towards clean environment and electric mobility despite the low number of vehicles. As against this, a city like Mumbai in India has over 4000 buses run by Brihanmumbai Electric Supply and Transport (BEST), not to mention the other modes of transport and no measure comes near this focused plan and its implementation by Barcelona’s various government bodies! Value Chain Electro-Mobility facilitates the companies and organisations already in the field of mobility and with very high potential, to consolidate their activities or even to expand. On the other hand, this new technology offers those companies and entrepreneurs that had no opportunity to appear in this new value chain as they were working with conventional mobility, the possibility of entering.